The dispute between China and the Philippines, like those between China and other Southeast countries, concerns traditional claims of territorial sovereignty and the revanchist claims of China. Thi case is notable in it being subject to a Law of the Sea Tribunal and because it has become one of the most built-up islands and one of the most militarized. The 9-dash nine (or 10 or 11 dash) date back to 1947 and the People's Republic of China's agreement with Taiwan on sea claims. It has largely been a matter of concern until the last decade though there were ocasional clases, notably between Vietnam and China. Their 1988 clash resulted in numerous casualties on the Vietnamese side, though it was claimed that China killed men who carried no weaponry. Both the Philippines and China are members of the Law of the Sea (LOS) treaty and are bound to arbitration in disputes. The case only asked if China's 9-dash claims invalidated the Philippine right to a 200 mile EEZ, as guaranteed under the Law of the Sea Treaty. The panel found no evidence to their historical claim. The panel on the case ruled that the claims of the Philippines were not negated by China's claims. China refused to accept the ruling and disputes it to this day, as does Taiwan. China has also embarked on a gargantuan project to build up the shrinking coral atolls into viable military and economic bases. On some of the Spratly Islands and on Mischief Reef, China's has begun an enormous dredging project, along with concrete, to make these islands into permanent bases and in some cases, capable of landing air-craft. While the U.S. and other countries vigorously protest china's moves, the new Filipino government under Duterte seems to have shifted towards Beijing and not longer seems to disputes the claim. China has also sweetened relations with large economic investment and funding. 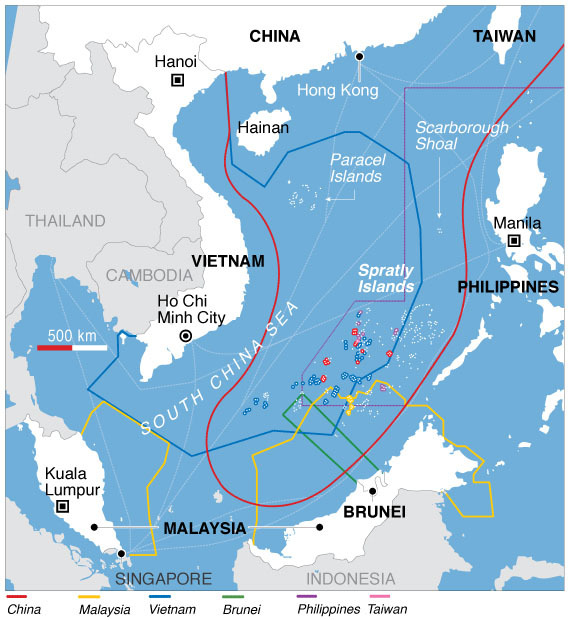 South China Sea Claims, Source: Voice of America (public Domain), via Creative Commons. Claims also cover environmental issues of control over Exclusive Economic Zones and possible off-shore continental shelves, as well as the seaways through this most important route in the world. The islands are being built up not only for stabilizing and enlarging them for air and sea transport. The islands do not really meet the definitions set forth under LOS, since they are often prone to flooding. With climate change, the islands are in many cases on the brink of disappearing under the water. Prior to the build-up, most of the islands were underwater during high tide periods. The ruling noted that claims to islands are only legal under the LOS treat when they exist under natural conditions and without extensive reclamation. The territory is itself strategic in being a port for air and sea travel. Control of the resources though seems to be the more vital reason for actions to date. A Prior ITLOS case set the stage for the finding in this case regarding India and Bangladesh. The decision set the maritime border in the territorial ocean claim area, the EEZ, and the continental shelf. Key to the case is the instability of the coastline, now and into the future. The award intends to “end decades of uncertainty as to the allocation of maritime entitlements within the Bay of Bengal” (Burke 2014). The basis for the border was the midstream of the main channel of the Haribhanga River. The PCA determined that South Taplatti/New Moore Island was not a “suitable geographic feature” (Permanent Court of Arbitration 2014, 74). Bangladesh also claimed economic dependence on fishing as an industry and a societal need, but the panel disregarded this argument. Bangladesh was awarded access. Mark Rosen (2013, 14) called the decision “judicial activism.” Furthermore, the decision regarding the disputed St. Martins Island was notable in discounting the island’s impact on territory or sea claims. “One can only envision that ITLOS took a cue from the International Court of Justice that was concerned with the worldwide trend for states to go rock or island ‘hopping’ to acquire large swaths of ocean territory” (Rosen 2013, 17). The ruling suggested that if the tribunal were to deliberate on the contested island claims in the South China Sea, no doubt it would find in a similar fashion and discount their importance in claiming offshore territory. No wonder the Chinese judge on the ITLOS case strongly objected to the ruling.